INDIANAPOLIS (AP) A strong first-half allowed the Indiana Pacers starters to rest for most of the second half. ”We got to do some cheering today,” Pacers guard Victor Oladipo said of reserves receiving quality minutes in a blowout. Indiana second-year forward Domantas Sabonis, coming off a personal-best 22 points and 12 rebounds on Sunday, had a double-double in the first half with 10 points and 12 rebounds. He finished with a career-high 16 rebounds in addition to 12 points and five assists. Kings: Five different players have led Sacramento in scoring in seven games. This was the third time Fox has had the most points. … They’ve been outrebounded in each of their six losses, and by a combined 283-198. Pacers: Oladipo, acquired with Sabonis in an offseason trade that sent All-Star guard Paul George to Oklahoma City, had led his team in scoring in the previous six games. . Third-year forward/center Myles Turner missed his sixth consecutive start due to a concussion and sore neck, but is close to returning after completing a normal practice workout on Tuesday. Each team has a starting point guard who used to suit up for the other side. Pacers point guard Darren Collison, in his second stint with Indiana, played the previous three seasons for the Kings. Indianapolis native and longtime Pacers fan favorite George Hill returned to face his hometown team, which traded the point guard to Utah in a three-team, offseason deal in 2016. Hill, who had played five seasons for the Pacers, signed with the Kings in the offseason and has averaged 9.8 points and 3.0 assists in five starts. Hill averaged a career-high 16.9 points for the Jazz last season. They share the same, unusual, lengthy last name, but aren’t related. 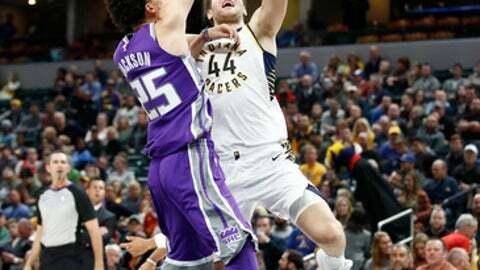 Small forward Bojan Bogdanovic, who signed as a free agent with the Pacers for his fourth NBA season, is from Croatia. Kings rookie shooting guard Bogdan Bogdanovic, three years younger at 25, is from Serbia. Kings: Wednesday they travel to Boston, which hasn’t lost at home to Sacramento since 2007. Pacers: Wednesday they travel to Cleveland to face LeBron James.